There’s just something about going to bed knowing that when you wake up a delicious, healthy and easy breakfast will be sitting there just waiting to greet you. It puts a little spring in my step in the morning when my alarm goes off (and by my alarm, I mean my husband’s). Last night I whipped out one of my trusty mason jars and a few ingredients I had in my pantry and put together this oh-so-delicious and good for you spiced-chocolate chia seed pudding. It’s so ridiculously simple and good I see no reason why I can’t have it every morning! Grab yourself a mason jar or an air-tight container. Dump all aforementioned ingredients in said container. Shut container and throw into the fridge. In the morning, take out of fridge, plop into bowl and add whatever the heck you feel like adding. Voila! You’re good to go! You’re going to love this recipe. I promise. Go straight-up bananas with me and give this easy raw, vegan breakfast bowl of goodness a try and let me know how it goes. Oh, and add me on Instagram! These bad boys just got featured on #feedfeed AGAIN! This. This right here is happiness. My chewy raw cinnamon, coffee and chocolate cashew bars! No refined sugar, no dairy and no gluten. Oh…and lots of flavor. I promise. Today I’ve got another easy, quick and healthy dessert recipe for you brewing right now in the Straight-up Bananas HQ. I know what you’re thinking. Is she posting yet ANOTHER brownie recipe? My answer to you is ‘yes, God damnit’! I do what I want. And I want brownies in and around my mouth so shush! This recipe is awesome because it’s not only gluten free, dairy free and sugar free, but also jam-packed with protein and fiber! Perfect for those who like to bulk up on protein (like the mister). This magic ingredient here is that I’m using black-eyed peas to keep the brownies moist since I’ll be using almond and oat flour instead of traditional flour. At this point, I know you think I’ve gone completely bananas, but you’ve got nothing to lose! Go Straight-up Bananas with me and give it a try! Then, sift together the oat flour, baking powder, cocoa powder and almond flour together and mix with the wet mixture until well incorporated. Then, mix in the melted chocolate. Place in a baking tray and top with chocolate chips. Bake for 20-30 minutes (until the mixture has juuuuust set but is still a bit gooey in the centre. Let cool and then cut up into cubes. Voila! There you’ve got it! 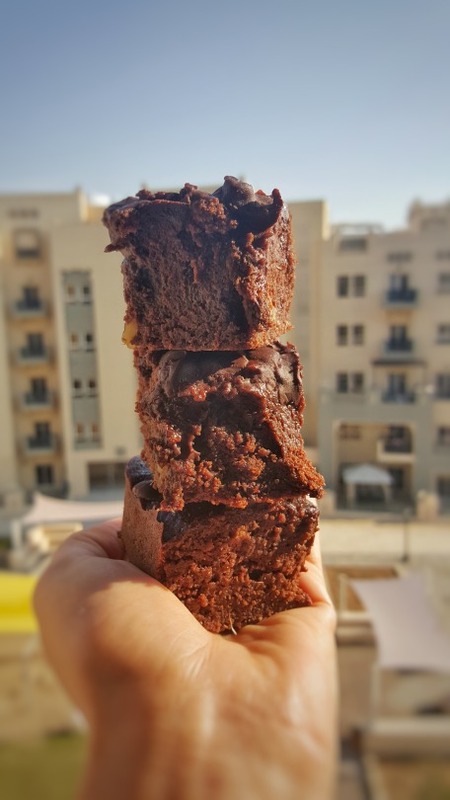 Easy, healthy chocolate chip brownies that are not only good for your body but absolutely delicious! Go Straight-up Bananas and give them a try. THEN, follow me on Instagram please by clicking here.